Winter 1942. Manchester’s twin city, Leningrad, lies in ruins, crumbling in the face of relentless siege. Surrounded on all sides, the city’s inhabitants starve, and burn whatever they can for warmth. Exhausted from the relentless onslaught, spirits are broken, and bodies pile up in the snow. In these dire conditions, an orchestra is hastily assembled to perform a new symphony, Shostakovich’s Leningrad. The side drum player is so weak that his colleagues think him frozen to death. The epic new work is performed, and its recording is blasted out at the invaders via loudspeakers on the city walls. The idle ‘invasion’ theme is twisted into a monstrous wall of sound, and the symphony finishes in a blazing triumph of C major. But is this music really about invasions, or does it describe the insidious spread of fascism? The European Doctors’ Orchestra consists of doctors of all specialties from across the continent. 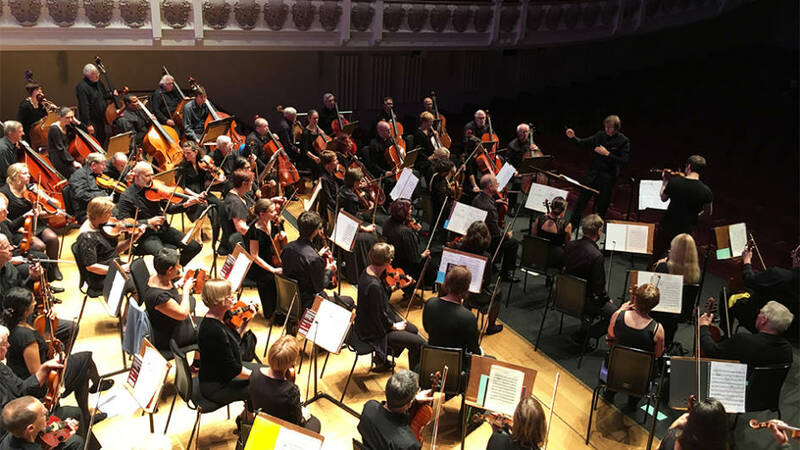 They meet twice annually for charity concerts in aid of local charities, recent highlights have included sell-out performances of Mahler’s Resurrection symphony in Belfast and Dvorak’s New World in Nantes. This first visit to Manchester will see all ticket sale profits donated to St Ann’s Hospice, a much-cherished local cause. The St George’s Singers join the European Doctors’ Orchestra for Brahms’ life-affirming Song of Destiny, and Copland’s Fanfare for the Common Man opens the concert. With a pan-European orchestra playing music of such high stakes, this promises to be a profoundly moving evening.